The Okavango Delta is one of the most sought-after wilderness destinations in the world. Life in the fast lane takes its toll, and more travellers are wanting to not only get off the grid, but completely off the map when on vacation. But delivering luxury in the middle of nowhere is by no means an easy feat. Liesl Venter spoke to some tourism experts to find out what is entailed in providing luxury in remote locations. As the world becomes more complex, over populated and polluted, there is an instinctive yearning for more ‘meaningful’ travel. “Our advantage in Africa is that we are able to connect travellers with nature and present them with unique experiences that they can’t have anywhere else in the world,” says Janie van der Spuy, luxury travel and hospitality expert and Head of FiveStar PR. Not compromising on luxury, however, isn’t easy, considering where some of these properties are located. “Most properties take their location into consideration long before they even open the doors,” says Anita Streich, Managing Director of African Travel Concept luxury division, Elite Travel Concept. 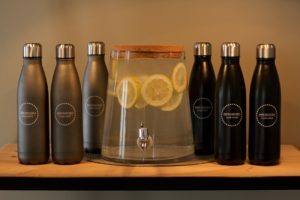 This does not mean that these establishments don’t have all the bells and whistles, but it does mean, because of their remoteness, they are able to offer experiences that would not easily be replicated in the rest of a client’s journey. “That is what people are after more than anything else,” says Streich. According to Chris Anagnostellis, Chief Operations Officer of An African Anthology, says delivering this very experience nowadays, does have some benefit in delivering luxury. African Anthology’s Elephant Valley Lodge is surrounded by the peaceful wilderness of the African bush. This is because, while luxury will always be synonymous with the finer things in life, it has become an interpretation for many. “If the experience being sought is isolation and remoteness, for example, then luxury could easily be interpreted as being in a tented camp in the middle of the Okavango where the guest can see the stars at night and watch animals close by in the day. It would not necessarily then matter if it was just a standard tent, because the luxury would be found in the richness of the experience,” explains Anagnostellis. Having said that, he admits that there are very few luxury establishments that don’t deliver pretty extraordinary service and facilities in areas where there is just about nothing else. Nicky Coenen, General Manager of The Last Word Intimate Hotels, says people are prepared to pay for exclusivity. He says often when it comes to food it is important to source some of the produce locally and to use local people for the washing of bedding and linen, for example. At a price, that is. 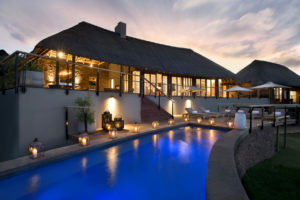 Mhondoro Game Lodge is a luxurious private game lodge in the Welgevonden Game Reserve in Limpopo. The super-rich have always liked Africa. Perceived as dark and dangerous, yet vibrant and colourful, the continent has traditionally been a top choice for the wealthy thanks to its ability to deliver holidays unlike anywhere else in the world. Liesl Venter finds out more about these high-end travellers. Millionaire tourism in Africa has been on the rise for several years. In 2016 a study by a Johannesburg-based research institution found that in a period of 12 months around 43 000 individuals with nett assets of $10 million or more visited the continent for a holiday. While this might sound like a lot of money to the average traveller, for a multi-millionaire, luxury in Africa is relatively cheap – all things considered. “And our offerings are incredible,” says Anagnostellis. Most people dream of that luxury holiday one day when their ship comes in, but for the average multi-millionaire anything is possible. Ranging in age and income, some are born into wealth while others are self-made. “We are seeing an increasing amount of visitors who have created their own wealth and are rewarding themselves with luxury experiences in Africa,” says Anagnostellis. “This market also includes multi-generational families on a trip-of-a-lifetime, business travellers extending their trip to add on some leisure time, and wealthy retired couples,” says Janie van der Spuy, luxury travel and hospitality specialist and Head of Fivestar PR. “The world is also seeing extreme high-end travellers emerging from a new generation of young entrepreneurs and top earners within the technology, finance and investment, media and entertainment and other industries. This brings a younger, and more adventurous high-end traveller into the mix, some of whom are travelling with young children too,” she said. What are the experiences they are after? “Safaris, the bush, remote wilderness locations and Africa’s wild animals are all firm favourites,” says Nik Lloyd-Roberts, Commercial Manager of Federal Airlines. The Sabi Sand remains top of the bucket list for most high-end safari travellers. According to Streich, demand for countries like Angola and Zambia is increasing. “They want to go to places that are not the obvious countries people travel to and that is part of the attraction. Exclusive is the key word.” She says immersive experiences are also gaining track where the traveller is given the opportunity to live like a local. “It is all about responsible luxury that involves giving back to society. And something that affords them ‘bragging rights’ among their peers to a certain extent.” According to Streich, high-end travellers are prepared to pay for exclusive destinations and experiences. Tintswalo Atlantic has launched a fun new half-day tour of Cape Town that is specifically aimed at families with children. Conducted by a professional in-house tour guide, the Tintswalo Cape for Kids excursion forms part of a new selection of tailor-made sightseeing tours available to Tintswalo hotel guests. As part of the Cape for Kids tour, young explorers may pick two activities from a choice of five, including Acrobranching; a visit to Kalk Bay Harbour; experiencing the workings of an Ostrich Farm; a lofty camel ride at Imhoff Farm; and Bike Fun at the Constantia Uitsig Bike Park. 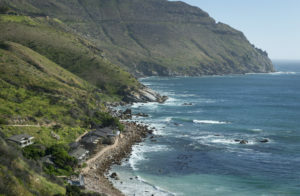 Activities will start with a delectable three-course breakfast at the picturesque hotel on Chapmans Peak, where guests will meet resident guide Percy Denhere. Originally from Zimbabwe, Denhere has been in the industry for over 10 years. He began his career at the Mount Nelson as a porter, valet and driver, before qualifying as a tour guide and freelancing at first for various professional tour operators. As part of the Tintswalo team the charming tour guide is knowledgeable about Cape Town’s hot spots, as well as its hidden gems. He has a deep understanding of the Cape’s rich history, which coupled with a great sense of humour, a love for children and an attentive but relaxed attitude, makes him the perfect tour guide. The Cape for Kids Tour includes transfers, a picnic basket of light snacks and drinks, as well as light lunch platter on their return to the hotel, from R4500 per family of four. Guests will make their way along the winding roads of the Constantia Winelands, and on to the Constantia Nek Forest for a taste of adventure at Acrobranch. Located right beneath Cape Town’s majestic mountain range, this adrenaline-fuelled aerial activity will have visitors of all ages revelling in exhilarating tree-top adventures, as they move from tree to tree via zip lines, swing bridges, Tarzan swings, cargo nets and high ropes. Budding marine biologists can visit the Kalk Bay Harbour in False Bay to learn about the different types of fish on sale, and enjoy the sight of seals swimming and frolicking in the sea. Guests will join a 30-minute tour at a Cape Point Ostrich Farm to gain insight into the life cycle of ostriches from egg to adult – plus other fascinating details about this biggest non-flying bird in the world. During the tour, children will also get the chance to feed the ostriches from the palms of their hands. Families will head off to the renowned Imhoff Farm in Kommetjie, for a fun camel riding experience atop the two-metre giants. While there, children can also learn more about a variety of farm animals, and take a 45-minute tour through the nature reserve and its breathtaking scenery of Kommetjie beach, Noordhoek beach, Chapman’s Peak and Hout Bay. Laps of fun for cyclists of all ages and skills can be expected at this adventurous cycle park on the beautiful Constantia Uitsig wine farm. Designed by Downhill World Champion, Chris Nixon, the exhilarating tracks include beginner jump lines all the way to expert drop-offs, rock gardens, a wodden berm, rollers and a suspension sky bridge – ending in a corkscrew exit. 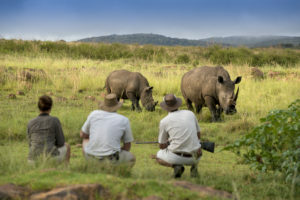 Mhondoro Safari Lodge has introduced rhino tracking as a new guided activity within the Welgevonden Game Reserve in the Waterberg (Limpopo province, South Africa). Spread across 35 000 hectares, Welgevonden is home to a large population of White rhino (Ceratotherium simum), protected by an effective anti-poaching unit within the borders of the reserve. Accompanied by experienced game rangers, guests have the opportunity to embark on a once-in-a-lifetime experience in search of these highly endangered animals, which are widely prosecuted and poached for their horns. Due to the varied terrain, rhinos can be tracked on foot and observed in their natural habitat. The male White rhino weighs in at more than 2000kg. As grazers they are perfectly at home in the beautiful valleys and plateaus of the reserve. Welgevonden’s rhino population is in very good health, with a few youngsters born each year. Thanks to large numbers of rhino in the reserve, guests have an excellent chance of tracking a ‘crash’ of rhino, the collective noun for these large pachyderms, and may even be lucky enough to catch a glimpse of a juvenile or a new-born still learning the ropes from its mother. During this unique excursion, rangers will share up to date information about the current and historical status of these ancient animals, including educational aspects relevant the species’ protection status, its physiology and behaviour. After completing a BSc Agriculture in Viticulture and Oenology at the University of Stellenbosch, Chris Albrecht gained international experience spending three years working six vintages in three different countries. These included two harvests in New Zealand, the first at a small family-owned property in Gisborne and the second an industrial-scale operation in Auckland. In France he further extended his knowledge learning from a chateaux owner in the Cote de Bourg commune of Bordeaux and a harvest the following year in Lalande de Pomerol. Returning to South Africa, he spent four years as the Winemaker at Topiary Wines in Franschhoek. Topiary was then a newly built winery with established plantings of Shiraz and Cabernet Sauvignon. It was however a young block of Chardonnay that would prove to be the future star. During his tenure at Topiary, both the 2008 and 2009 MCC Blanc de Blanc was awarded 5 stars in Platter’s Wine Guide. 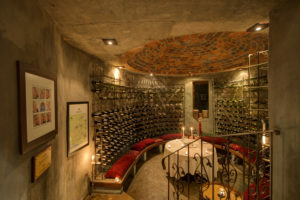 While working at Topiary, he also had the opportunity to take a brief sabbatical to spend a vintage in California’s Paraduxx, which is part of the Duckhorn stable. 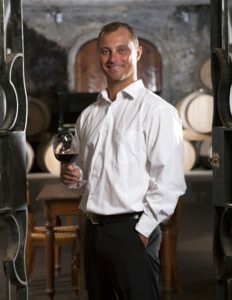 In December 2010, Albrecht started his career at Bouchard Finlayson, cutting his teeth on Pinot Noir in the envious position as Peter Finlayson’s assistant. As from the 2017 harvest, he was promoted to head production. His travels abroad in support of marketing efforts have included a study trip to Burgundy earlier this year, offering fresh inspiration and benchmark perspective. 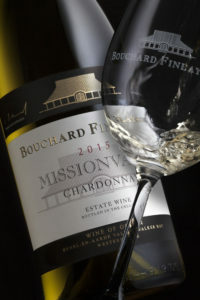 Bouchard Finlayson continuous to rake in accolades, not only for Pinot noir, the cultivar it’s best known for, but also for its excellent range of Chardonnays. During Albrecht’s tenure at the winery, the 2015 Missionvale Chardonnay was awarded Gold in the 2017 International Wine and Spirits Competition (IWSC), one of the world’s most prestigious wine competitions, after the 2013 Galpin Peak Têtê de Cuvée Pinot noir also won a Gold Medal in the same competition, the year before (2016). The 2015 Galpin Peak Pinot noir won a Gold Medal and the Regional Trophy in the International Wine Challenge (IWC) 2017, after the 2013 vintage scored 5 stars in the 2016 Platter Wine Guide. Bouchard Finlayson was celebrated on the world stage at the Intrepid South African Trade Show in London, where it was announced on 13 September 2017 that its famed 2015 Missionvale Chardonnay received a Gold Award in the International Wine and Spirits competition (IWSC) 2017. At the same time, it was revealed that the 2015 Crocodile’s Lair Chardonnay was scored at 95 points by Tim Atkin. This has once again proved the Hemel-en-Aarde Valley and its associated terroir to be one of the Cape’s most treasured Chardonnay locations. These new releases are now available at the winery at R151 per bottle for the 2015 Crocodile’s Lair/Kaaimansgat Chardonnay and R239 per bottle for the 2015 Missionvale Chardonnay. Various vintages from the Bouchard Finlayson stable scored equally well in Tim Atkin’s South African Special Report for 2017, with Medals of Excellence awarded to no less than four other vintages. These include scores of 93 for the 2013 Têtê de Cuvée Pinot noir, the 2015 Galpin Peak Pinot noir, and the 2015 Missionvale Chardonnay, and 92 for the unique 2015 Hannibal red blend. James Suckling, in his South African Report 2017, also rated the current Bouchard Finlayson vintages highly, scoring the 2013 Têtê de Cuvée Pinot noir at 94 points, followed by the 2015 Galpin Peak and 2015 Missionvale both at 93 points, 2015 Hannibal at 92 points, and 91 points for the 2015 Crocodiles Lair Kaaimansgat Chardonnay and 2015 Sans Barrique. Wrapping up the international awards season, Greg Sherwood MW, scored the 2014 vintage of the Crocodile’s Lair Kaaimansgat Limited Edition Chardonnay at 94 points, in his 2017 report of ‘A fine wine safari’. Mhondoro Safari Lodge has introduced a range of children’s activities aimed at families booking Mhondoro Villa on an exclusive-use basis. Located in the malaria-free Welgevonden Game Reserve in the Waterberg, the villa sleeps six people and welcomes children of all ages. Children’s programmes are tailor-made to accommodate all ages and include Insect bush walks; Making of animal track moulds; Baking with the chef; Archery; Herb gardening; and Hair braiding. Families booking the Villa enjoy the services of their own ranger and game viewing vehicle. Children are welcome on game drives exploring the magnificent 35 000 hectare game reserve, which is home to many plant and bird species, in addition to more than 50 different type of mammals. Guests may look out for the ‘Big 5’, including the endangered white rhino, and could even spot some rare and unusual species such as brown hyena, aardwolf, pangolin and aardvark. Babysitting services are available and little travellers can run free in a dedicated open-air play area, which is protected by an elephant fence, while older children may participate in stargazing evenings using the telescope stationed on the Stardeck. Mhondoro has a unique underground game viewing hide, connected to the main lodge with a 65m underground tunnel, which provides children with the adventure of game viewing from a distinctive ground level perspective. The hide is accessible anytime day or night, and provides the opportunity to get close up to buck, baboons, zebra, warthogs and even elephants drinking from the waterhole. Ideal for families or groups of friends travelling together, Mhondoro Villa providing a luxurious yet comfortable home-away-from-home. The magnificent Villa Master Suite has a spacious bathroom with both indoor and outdoor showers, and a separate private lounge and study. There are another two bedrooms, which both come with en-suite bathrooms. The large, open-space kitchen, dining and lounge area provides ample opportunity for relaxation and entertainment, leading out to the wooden decks with sun loungers and a heated pool for all-year swimming, with views of the lodge waterhole and the wilderness beyond. 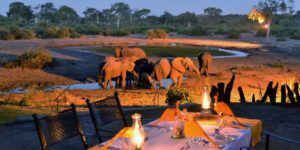 On balmy summer evenings, the Outdoor Lounge sets the scene for relaxing sundowners while watching ‘resident’ elephants stop by the waterhole for a drink, while a cosy indoor and outdoor fireplace means that guests can enjoy the magic of the wilderness even on chilly nights. A private, fully-equipped gym and yoga room are ideally located within the Villa for those wishing to start the day with a rejuvenating workout, yoga or Pilates session. For bigger groups, the Villa can dine up to 10 people when the rest of the party book rooms in the adjacent main lodge, including the option of a 2-bedroom Family suite. Known for championing various community and outreach programmes throughout South Africa, Tintswalo is proud to help facilitate entrepreneurship and promote up-and-coming local talent. The family owned company has been instrumental in the success of a collective called The Riversands Incubation Hub in Johannesburg – a large-scale business incubator that was established in 2015 through a partnership between the Tintswalo family’s Century Property Developments and the Jobs Fund. The Hub works with black-owned start-ups, as well as already established businesses, offering entrepreneurs exhibition space, and business and skills training programmes – with the aim to foster the development of high-potential enterprises. One of the success stories to emerge from The Hub is that of ceramic artist Joe Govo. Born in Zimbabwe, Govo (41) remembers falling in love with art at the tender age of five, while watching his uncles paint artworks. Entirely self-taught, he followed in the footsteps of his family, initially by selling his own paintings to women in his local neighbourhood. His calling for ceramics came later, at the age of 20, when he started to work for a local ceramics company called Penzo Zimbabwe. In 2004 he moved to South Africa to join the art collective Intu-Art (now Artists of Africa) in Johannesburg. In 2006 he established Joe Govo Ceramics, a proudly South African business concept that embraces passion, creativity and human development. 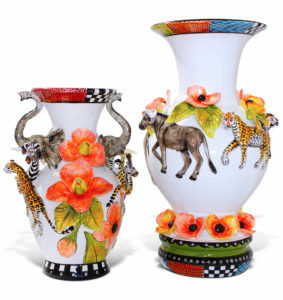 Over the years Govo has collaborated with several other ceramic artists. These fruitful collaborations have elevated his public exposure, and helped develop diversity within his own ranges. In 2013 the talented artist crafted his successful ‘Citizenship’ collection of ceramics, conceptualised by Creative Director Rial Visagie from the Ceramic Factory. Govo’s collections, including his current Rhino Collection, Tableware Collection and Loft Living range, draw inspiration from nature, wildlife, as well as humans and current issues. His Rhino Collection for instance aims to raise awareness for the plight of the rhino, while also celebrating the majestic endangered animal through his designs. 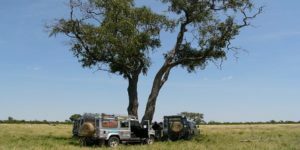 This is in line with Tintswalo’s own efforts in this field – Tintswalo Safari Lodge aims to provide funding and support the Southern African Wildlife College (SAWC), for a variety of urgently needed anti-poaching interventions in the Manyeleti Game Reserve, Greater Kruger National Park.